A former White House speechwriter under the Nixon Administration, Ben Stein, tries his hands at making a documentary film. Unfortunately Benny-Boy surrounds himself with a talentless first-time director, Nathan Frankowski, and two hack screenwriters with only one previous credit between them. As a result, is it any wonder EXPELLED exhibits "no intelligence" whatsoever when it comes to any phase of motion picture production: development, pre-production, principal photography or post production? This film is so bad I barely know where to begin. Supposedly Intelligent Design is not about Creationsim, not about Christianity and not about Religion. What it is about is impossible to decipher based on what is presented by Benny and his "pets" -- hand-picked scientists who, from what I saw, couldn't even handle the care and feeding of a seahorse in middle school. Their attempted explanation for the origin of the species was specious at best. 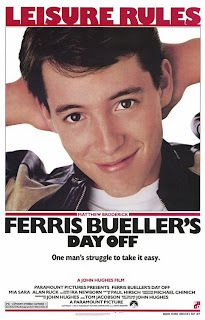 Again, what should have one expected from someone whose biggest claim to fame is a relatively minor role in FERRIS BUELLER'S DAY OFF? Like a ride on a ferris wheel, Herr Stein's round-and-round assortment of disjointed interviews goes nowhere. In what is a bigger stretch than a condom on John Holmes' willy, Herr Stein gives us what I can only describe as ill-advised scenes correlating Darwinism to Hitler's concentration camps. Call it "Stein's Kampf" if you want, but this supposed connection comes with a Holy Cost -- by now there is virtually no credibility to anything presented on screen. Even a Bible-belt Baptist will find this analogy harder to swallow than Jonah. And it doeesn't just end with scenes of the holocaust and Nazi death camps. You see, Herr Stein goes on in his inimitable, smug, disingenuous way to compare not only Darwin to Hitler but to Stalin and Lennon as well. As in John Lennon, believe it or not. I suppose an argument can be made that nature is so incredibly complex that it is impossible to have it happen randomly and, therefore, there must have been a creator of some kind. This creator, I've been told, could have been anything of intelligence, including aliens landing on earth. Then again, who/what created the creator? These are difficult questions, indeed. 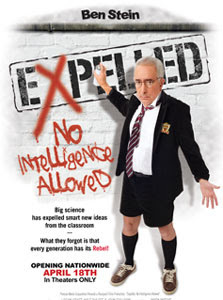 The one answer we can come away with in watching EXPELLED is that the arguments for Intelligent Design are way beyond the capability of being articulated by one Mr. Ben Stein. Maybe Alan Shore could do the trick. Until then, the only "intelligent design" I know of comes from Ron Popeil and his creations at Ronco.